In terms of unreasonable effectiveness, the transformation to continuation-passing style (CPS) ranks with the Y combinator. During compilation, high-level control constructs ranging from coroutines and exceptions to while loops and break statements steadily desugar into a mixture of two constructs: calls to functions and calls to continuations. Then, during CPS transformation, continuations desugar into functions. A single control construct remains: lambda. Knowing how to convert code into CPS, either by hand or algorithmically, is a powerful weapon in the programmer's arsenal. Yet, there are many methods for transforming into CPS. Danvy, Millikin and Nielsen have been able to connect some of these methods, including the well-known treatments in Appel's Compiling with Continuations and Queinnec's Lisp in Small Pieces . Even with these connections, learning CPS transformation remains difficult. The goal of this article is to introduce CPS transforms in small, individually digestible pieces before stitching them back together as a unified whole. If you're new to continuation-passing style, I recommend my earlier post on continuation-passing style by example. The CPS world has two kind of expressions: atomic and complex. Atomic expressions always produce a value and never cause side effects. Complex expressions may not terminate, and they may produce side effects. For the fourth transform, it will become partitioned CPS, and for the final transform, it will be a more realistic intermediate language with side effects, conditionals, basic values and explict recursion. The naive transformation likely dates to Plotkin's earliest work. It is the transformation that newcomers often discover for themselves. T : expr × aexp => cexp takes an expression and a syntactic continuation, and applies the continuation to a CPS-converted version of the expression. The expression (T expr cont) might be read "the transformation of expr into continuation-passing style, such that cont will be invoked on its result." In the function-application transform, the values of both the function and the argument have to be converted into CPS. Even while this transformation is simple, its results are poor. The transformation of function application is the main culprit: the transform assumes that the function and its argument are complex expressions, even though most of the time, they will be atomic. 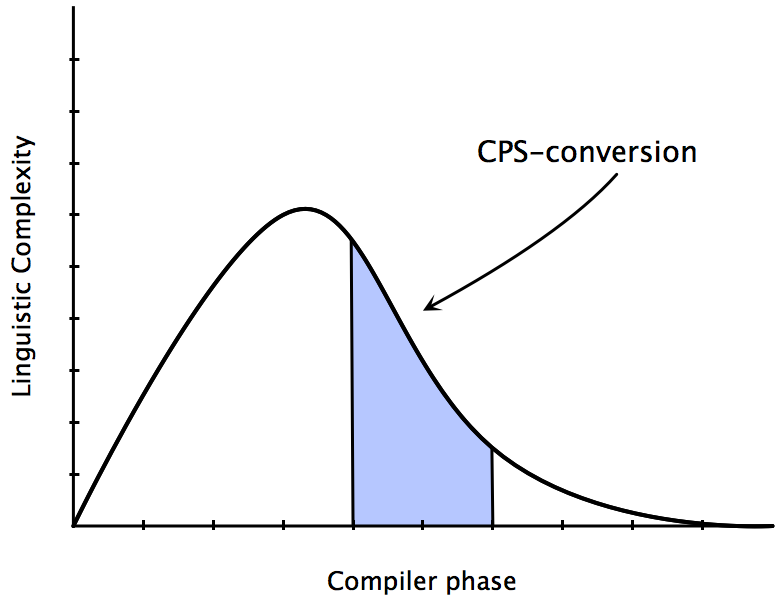 The higher-order CPS transform is a response to the drawbacks of the previous CPS transform. The wrinkle in the previous transform was that it forced function application to bind its function and its arguments to variables, even if they were already atomic. If the transform receives a real function expecting the atomic version of a the supplied expression, then the transform can check whether it is necessary to bind it to a variable. This simple shift in perspective is economical: if the expression to be transformed is already atomic, it need not be bound to a fresh variable. This is two steps forward, and one step back: the higher-order transform eliminated the redundant bindings, but introduced an η-expansion around the continuation. Combining the naive and higher-order transforms provides the best of both worlds. At first glance, it seems that CPS destroys the stack. All calls become tail calls, so in effect, there is no stack. Yet, if the transform tags variables, call forms and lambdas as being user or continuation, the stack is recoverable. A κ form is equivalent to a λ form, but it indicates that this procedure is a continuation introduced by the transform. Because continuations are used in a last-allocated, first-invoked fashion, we can implement them as a stack. We can even use the stack pointer register. When a continuation gets allocated, bump the stack pointer. When a continuation gets invoked, deallocate its space by resetting the stack pointer to that continuation. In the absence of call/cc, this is provably safe. And, even with call/ec in use, this is provably safe. The lambda calculus makes a nice platform for studying the architecture of a program transformation. Ultimately, however, that transformation must run on real code. Fortunately, the hybrid CPS transform readily adapts to features like basic values, conditionals, side effects, sequencing and explicit recursion. The new cases for T-k look almost the same. The transformation for letrec is not hygienic, because the transformation can introduce the letrec'd bindings into the scope of the continuation that gets passed to the transformer. If you're using this in practice, alphatize the program first, or modify letrec to bind the continuation to a variable outside the scope of the letrec. lc-convert.rkt : the naive converter. lc-ho-convert.rkt : the higher-order converter. lc-hybrid.rkt : the hybrid converter. lc-partition.rkt : the partition converter. scheme-cps-convert.rkt : a converter for a richer language. Andrew Kennedy points out that CPS is more advantageous as an intermediate form with respect to optimization than had been previously thought. Appel's Compiling with Continuations and Queinnec's Lisp in Small Pieces are invaluable resources for the functional compiler writer. My post on implementing exceptions.